A British tourist told yesterday of his flight of terror when he claims an emergency exit on a superjumbo blew open at 27,000ft. 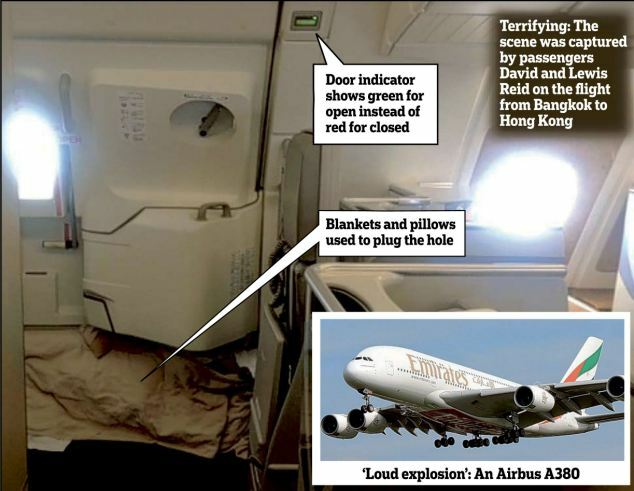 David Reid and his son Lewis feared a bomb had gone off after hearing a ‘massive explosion’ two hours into their flight on the brand new £250million Emirates Airbus A380. Freezing air blasted in and the cabin pressure plunged after the door in business class came an inch and a half ajar, leaving a gaping hole, said Mr Reid.